Your homestead garden is essential in self- sufficency. It is not too late to plan your garden. If you live in the south, you have three garden seasons and are never behind. 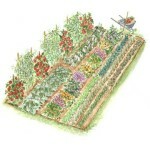 With the availability of grown plants, one can plop a garden in the ground in a day! If you are in the north, you haven’t even had the chance to work in your garden, yet. So you still have plenty of time. “Your garden will need to be defined by the number of hours you’re willing to spend gardening each week, how much space is available, how your garden fits into your yard, and what site makes the most sense. You’ll also have to decide whether you’re going to garden at ground level or in raised beds. You may also want to conside a separate garden for the children. 1. What do I really want to grow? 2. Do I want a combination in-ground and container garden? 3. How big should I make my garden? 4. How much time do I have to spend each week? 5. Can I integrate my garden into my landscaping? 6. Do I want raised beds? 7. Do I need to grow my garden against a fence to support my vine plants? 8. Do I want to garden vertically? 9. Does pocket gardening make sense in my yard? spaces that have a minimum of six hours of full sun and more for vegetables like tomatoes and peppers who thrive in the heat of the sun. Today you need to go outside and look around and decide where you will carve out a minimum of 100 square feet of space for gardening. You can do raised beds, vertical beds, roof top gardens, straw bale beds… there are many types of gardens if you do not have appropriate soil or do not want to garden at ground level. All these issues will be addressed in letters soon.